The path that leads to stardom is not always a straight road. While many celebrities made a name for themselves by nurturing and following one passion, some others got their big break after trying their hands on several odd jobs. In the case of Catherine Mary Stewart, however, she rose to immense popularity after she switched her interest from modeling to acting. Ever since her career started revolving around the acting industry, Stewart has continued to do exploits on the screen, earning the praises of filmmakers and fellow actors for her acting talent. Catherine is a talented actress born on 22nd April 1959, in Edmonton, a city in Alberta, Canada. She was born Catherine Mary Nursall to Professor John Ralph Nursall and Mary Stewart. The couple worked at the University of Alberta during their active years. Ralph was a biology lecturer while his wife was a teaching assistant. The actress has two brothers called Allan and John Nursall. While the latter is a freelance writer as well as TV/film producer and documentary director, the former is a media personality and scientist. He covers science news for the Discovery Channel and the renowned Canadian TV series, Daily Planet. Upon graduating from elementary school, Stewart enrolled into Strathcona Composite High School, where she completed her high school education. At the age of eighteen, Catherine, who was already proficient in dancing, decided to move to London to further her education at the Performing Arts School. There, she got an acting role in the 1979 film, The Apple. Not long after the actress completed the project, she relocated to Los Angeles to nurture and boost her young career. Catherine Mary Stewart would end up scoring bigger roles in other films such as Weekend at Bernie’s, miniseries: Sins (1986) and Hollywood Wives (1985), The Last Starfighter, Night of the Comet, Murder by the Book (1987), just to mention a few. Mary started making fewer appearances in film and television in the mid-1990s in order to give her kids and husband the needed attention. However, she has since returned to the screen now her kids have grown up, starring in small roles in film and television. Reports have it that Catherine Mary Stewart is currently working on how to become a film director in Hollywood. She indicated an interest in leading dramatic performances for the first time after she returned to Hollywood. 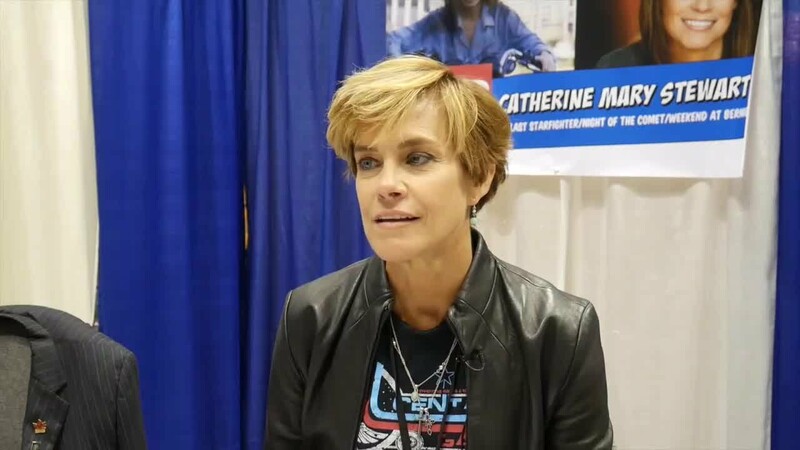 From her involvement in the production of Hollywood projects both in leading and supporting roles, Catherine Mary Stewart has garnered a net worth of $3 million. Now, she has fully returned to the industry and is aspiring to become a director, it is expected that her net worth will grow beyond this figure in the nearest future. Not everyone finds true love straight away. Some people fall in love and stick to their partner their entire life while others only find true happiness after several relationships. For Catherine, life would have been entirely different had it been she didn’t part ways with her first husband. Although no reason was stated for their divorce, the actress decided to call it quits with John Findlater in 1985, just two years after they got married. Findlater (born August 23, 1943) is a Los-Angeles actor known for starring in films such as Meteor (1979) and Airport (1970). He is yet to re-marry after he and Stewart called off their marital relationship. Since 1992, the actress has been happily married to film producer Richard Allerton. Catherine appears to have found true love in the arms of Richard; the two have never been in the news for scandals and there are no signs they are heading for divorce. Together, they share two children – Hanna Mary Allerton (daughter) and Connor McKay Allerton (son). The daughter, Hannah was born on July 27, 1993, while Connor followed on 29th July 1996. Stewart currently resides in Brooklyn, New York with her family. 1. Catherine Mary Stewart stands at a height of 1.68 meters and weighs 59 kilograms. 2. She was born with the zodiac sign Taurus. 3. The actress, who sports brown hair and blue eyes, wears a shoe size of 6.5 (US). 5. She loves traveling and exploring other people’s culture. 6. Her children are her greatest inspiration.